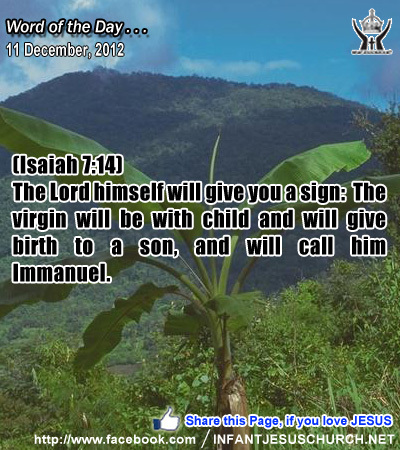 Isaiah 7:14: The Lord himself will give you a sign: The virgin will be with child and will give birth to a son, and will call him Immanuel. Heavenly Father, who refuses to be the god who is detached and far away: we thank you for coming to live among us in Jesus. We thank you and praise you for your sacrifice and pain. We know this sign cost you very much so please let us praise in prayer, song, thought and life reflect our thanks to you in Infant Jesus name. Amen. 12What do you think? If a man has a hundred sheep, and one of them has gone astray, does he not leave the ninety-nine on the hills and go in search of the one that went astray? 13And if he finds it, truly, I say to you, he rejoices over it more than over the ninety-nine that never went astray. 14So it is not the will of my Father who is in heaven that one of these little ones should perish. The shepherd's grief and worry is turned to joy when he finds the lost sheep and restores it to the fold. The shepherd searches in anticipation of what he has lost are found. His persistence pays off. What was new in Jesus' teaching was the insistence that sinners must be required time and time again. How easy to forget and be diverted with other matters while the lost become prey for devouring wolves of the soul. The Apostle Peter reminds us that the "devil stalks around like a roaring lion, seeking someone to eat greedily". God does not rejoice in the defeat of anyone, but desires that we be saved and restored to companionship with him. That is why the whole community of heaven rejoices when one sinner is initiates and restored to association with God. God is on a rescue mission today to save us from the critical forces of sin and evil. Jesus, the Good Shepherd, watches over every step we take. Do we listen to his voice and heed his wise counsel? Do we follow the way he has set for us - a way that leads to life rather than death? Loving Infant Jesus, nothing escapes your watchful gaze and care. May we always walk in the light of your truth and never stray from your loving presence.